Manchester City v Chelsea - Aguero OUT - Your thoughts ahead of the game? 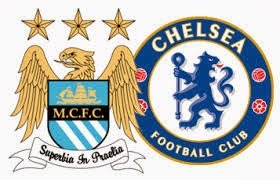 Manchester City v Chelsea on Monday night tests the Premier League's most potent attack against the meanest defence. The world will be watching and I am interested to know what your opinion of the game is at this early stage of the weekend. City have announced that Sergio Aguero is out injured for up to a month ahead of this one but of course with Man City you only have to look at the options Manuel Pellegrini has to call upon to replace the Argentinian. Eden Dzeko, Alvaro Negredo and Jovetic will all be fighting to start the game and it will be interesting to see if Pellegrini continues with his 4-4-2 formation at home. Chelsea on the other hand have limited option up front with Samuel Eto'o handed a start in our two previous games and Demba Ba waiting in the wings. With it being transfer deadline day today there is always going to be speculation surrounding Chelsea looking for a new striker. Jose Mourinho has re-iterated that after the signings of Matic, Salah and Zouma (today), all of our transfer business is closed so I cannot see any moves for a new striker until the summer. Chelsea have kept five clean sheets out of their last seven Premier League games and it's going to be a big ask at the Etihad on Monday. If Chelsea are going to win this game, and you would imagine Jose Mourinho would set out to do so, Mohamed Salah could play a big part in this one whether it's from the start or from the bench. The one thing Chelsea have in abundance now and especially in our attacking positions and I believe we can cause City all sorts of problems. We all know the power of City and what they are more than capable of. Could Jose Mourinho and his Chelsea side get a result on Monday night? What are YOUR early thoughts ahead of the game?